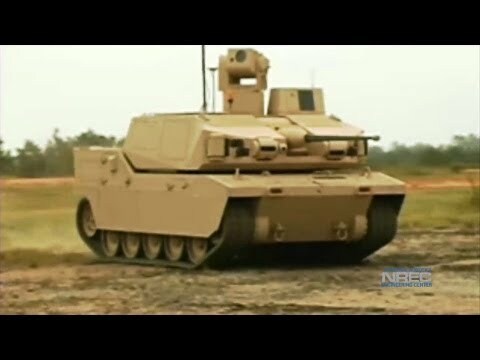 National Robotics Engineering Center (NREC) developed sensing, teleoperation and autonomy packages for BAE System’s Black Knight, a prototype Unmanned Ground Combat Vehicle (UGCV). Black Knight demonstrates how UGCVs can be used in the field and showcases current robotics technologies. NREC applied its expertise in sensor fusion, unmanned systems, obstacle detection, path planning, autonomy and teleoperation to improve Black Knight’s mission performance and support Soldier operation. Black Knight can be used day or night for missions that are too risky for a manned ground vehicle (including forward scouting, Reconnaissance, Surveillance and Target Acquisition (RSTA), intelligence gathering, and investigating hazardous areas) and can be integrated with existing manned and unmanned systems. It enables operators to acquire situational data from unmanned forward positions and verify mission plans by using map data to confirm terrain assumptions. Black Knight demonstrates the advanced capabilities that are available to Unmanned Ground Combat Vehicles (UGCVs) using current technology. Its 300 hp diesel engine gives it the power to reach speeds of up to 48 mph (77 km/h), with off-road autonomous and teleoperation speeds up to 15 mph (24 km/h). Its band-tracked drive makes it highly mobile in extreme off-road terrain while reducing its acoustic and thermal signatures. The 12-ton Black Knight can be transported within a C-130 cargo plane and makes extensive use of components from the Bradley Combat Systems program to reduce costs and simplify maintenance. Black Knight can be teleoperated from within another vehicle (for example, from the commander’s station of a Bradley Fighting Vehicle) or by dismounted Soldiers. Its Robotic Operator Control Station (ROCS) provides an easy-to-use interface for teleoperating the vehicle. Black Knight’s autonomous and semi-autonomous capabilities help its operators to plan efficient paths, avoid obstacles and terrain hazards, and navigate from waypoint to waypoint. Assisted teleoperation combines human driving with autonomous safeguarding. Black Knight was extensively tested both off-road and on-road in the Air Assault Expeditionary Force (AAEF) Spiral D field exercises in 2007, where it successfully performed forward observation missions and other tasks. Black Knight gave Soldiers a major advantage during both day and night operations. The vehicle did not miss a single day of operation in over 200 hours of constant usage.